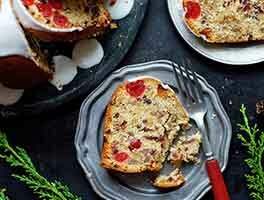 This tasty fruitcake features a sour cream pound cake base, and a filling of some of our very favorite dried fruits: cherries, apricots, pineapple, and golden raisins. Pecans or walnuts complete the picture. For a more colorful cake, add 1 to 1 3/4 cups of red candied cherries to the other fruit. 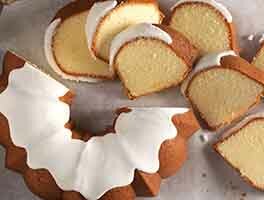 Or, if you'd just like a simple pound cake, omit the fruits altogether and bake it in two pans instead of three. And finally, if you're an aficionado of citron and its holiday friends, feel free to use those fruits instead. 3 hrs 40 mins. to 3 hrs 50 mins. To soak the fruit: In a medium-sized mixing bowl, stir together the dried fruits and the 1/2 cup brandy or rum. Set the fruit aside for 2 hours or longer. Stir occasionally, so the fruit absorbs the liquor evenly. Preheat the oven to 325°F. Grease and flour three 8 1/2" x 4 1/2" loaf pans. Alternately, line them with parchment, leaving an overhang on each side and securing the paper with metal binder clips. To make the cakes: In a large mixing bowl, beat together the shortening, sugar, salt and nutmeg. Add the eggs one at a time, beating until fluffy after each addition. Stir in the brandy or rum. Add half the flour to the shortening mixture, and mix well. Add the sour cream, beating all the time, then add the remaining flour and blend well. Be sure to scrape the sides and bottom of the bowl occasionally to be sure all ingredients are evenly incorporated. Stir in the fruits (they should have absorbed all the liquid; if not, don't drain them) and the nuts. Spoon the batter into the prepared pans. Bake the cake for 55 to 65 minutes, or until they're golden brown and a cake tester inserted into the center comes out clean. Remove the cakes from the oven and let them cool in their pans for 10 minutes. Remove them from the pans and cool completely on wire racks. If using a 10-cup (10") bundt-style pan or several smaller pans, adjust the baking time accordingly. No matter what pan(s) you use, don't fill them more than three-quarters full, or you'll be cleaning blackened cake batter off the floor of your oven. If you're making them well ahead of serving, brush them with brandy or rum before wrapping tightly and storing at room temperature. 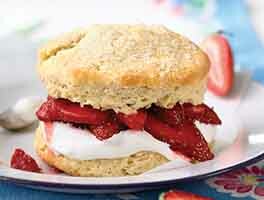 If desired, sprinkle with confectioners' sugar or frost with a light glaze before serving. 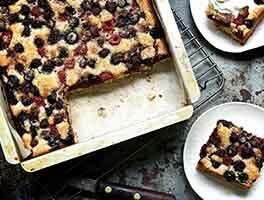 This recipe created a delicious, moist fruitcake! I used my favorite dried fruits, all butter, brandy, and pecans. The liquor flavor was mild. Using baking spray, the cakes released beautifully from my intricate snowflake cake molds with no problem. My only concern was that the outside of the cakes were dark--I assume because the non-stick coating of my pans was somewhat dark. Next time I make this, I'll reduce the temperature and extend the baking time. Thanks for the recipe! Made a very good fruitcake. I've tried multiple recipes and I would use this one again. Second year now making this recipe, made it as listed just used pecans ilo walnuts. The cakes came out perfect, the only thing I did was after it cooled a bit I brushed it with the brandy, wrapped it loosely in plastic wrap and then brushed it once a week for 2 more weeks while I stored it in a tin. The cake was moist and everyone liked it, even the fruitcake phobia folks. I tried this recipe because it didn't look like the typical fruitcake that people joke about at Christmas. I was not disappointed. This cake is nothing like "regular" fruitcake and is delicious. I followed the exact recipe (used all butter & rum) + brushed each cake with simple syrup while they were still warm. (Recipe for simple syrup from KAF Coconut Rum Cake) That made them nice and shiny. After cooled, I brushed each cake with golden rum. Kept them nice and moist. I baked in two Nordic Ware Anniversary Bundtlette pans (5 cup capacity each) I had a TON of leftover batter. Put leftover batter into Nordic Ware 6 Rose Bud pan and 1 loaf pan. None of the cakes became golden brown on the top, so I would not suggest relying on that as a guide as to when the cake is done. As a result, the bundtlette cakes turned out dry because they were baked for too long (35 minutes). Next time I'll try 25 minutes. I would recommend relying on the toothpick test for doneness. The Rose Bud Cakes took 33 minutes and the loaf pan 55 minutes. I filled the pans about 2/3 full, as usual. These cakes did not rise very much. Next time I will add much more batter to each pan. Wow! I grew up hating fruitcake. There were too many different tastes and always a heavy brandy flavor. I changed my mind at a Christmas party a few years ago but was unable to get the recipe. This one beats them all. I ordered the pan with four small bundts and the fruitcake fruit blend. I also added chopped apricots, pecans and butter instead of shortening. I can hardly wait to see the responses of the people who will receive these as gifts! You have never failed me, King Arthur. Your recipes and mixes are always winners. Thank you. Years ago I decided to make fruitcake because I did not like what I bought at stores. So every year I tried all kinds of different recipes. Even from KAF. I gave away some to people I know that love fruitcake like my husband & I do. 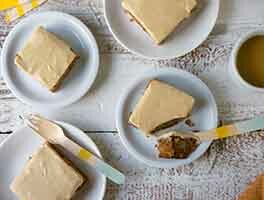 Everyone liked everyone I baked until this recipe. And I was told to quit experimenting that I had found my recipe. Since then its been the only fruitcake I make. And my list of people I give them to has grown. And repeatedly ask if I am going to make them, they just can't wait to get them. Thanks KAF. One year my husband ate 3 cakes over the Christmas season!! !